So you’re pretty hirstute and think that it is the back hair that turns on the ladies? Think again, dude. It is now in the 21st century and women prefer clean shaven guys instead. The new Razorba War Hammer Back Hair Shavers helps you out in the shaving department minus the pain, embarrassment and expense of waxing, or laser hair removal. 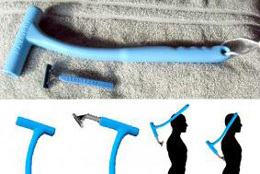 It can be used once a month and is compatible with some Gillette razor models for the closest shave possible. Be victorious in the war against back hair. The Razorba War Hammer features a new Super Shock Solid Core design, new razor grabbing technology—Hamr Grip II, improved ergonomics and larger head. The Hamr Grip II has triple the flexibility and four times the strength of the Razorba Classic. The War Hammer is the top of the top model and supports many more razors including the Gillette Fusion, Phantom and most Atras.